Click here for a free download of chapter one. On December 31, 1999, the Arts and Entertainment network (A&E) counted down the 100 most influential people of the last millennium. A panel of experts had met to decide who would be on the list. The list contained many of the people you would expect; Washington, Lincoln, Einstein, Hitler, Lenin, Henry Ford, and even Bill Gates. Nevertheless, there were also many surprises. One of the surprises was the #1 choice. Johannes Gutenberg was chosen as the most influential person in the last millennium. The program went on to explain that Gutenberg was chosen because of the effect of books on the last millennium and Gutenberg's effect on the availability of books. Without inexpensive available books, many of the other people on the list would have had a greatly diminished effect and without Gutenberg, inexpensive books would have been impossible. It's not clear yet whether the growing availability of eBooks will have as big an effect as Gutenberg did, but there are signs that eBooks are having an effect. On March 14, 2000, Stephen King released a new book exclusively through electronic medium. His eBook Riding the Bullet sold 400,000 copies on the first day alone, but within 48 hours, the secure encrypted copy had been broken and was available on several hacker websites. Steve Riggio, vice chairman and acting CEO of barnesandnoble.com, has been quoted as saying that he believes the eBook revenue stream will be much larger than for MP3 music. The Frankfurt Book Fair has established seven annual awards for eBooks, including a grand prize of $100,000. It's clear that eBooks are here to stay and will be a major part of the publishing industry in the new millennium. But what are eBooks and what are the benefits and challenges that face this emerging industry? How will the publishers and authors profit from the benefits and overcome the challenges in this relatively new medium? For the sake of this book, eBook Publishing will be defined as any combination of hardware, software, and content that delivers the equivalent of a traditional paper book. The hardware used may be a personal computer, a laptop computer, a dedicated reader platform, a personal digital assistant (PDA), or a web browser hooked to the Internet. The software used may be a custom designed reader, a web browser, or a simple text editor. The content is as broad as the subject matter in the traditional publishing industry. It ranges from fiction for light reading to highly detailed and technical non-fiction. The paragraph above describes an industry that is extremely broad and varied. It also guarantees that no one approach will be the best. Different types of content will be easier or more difficult to implement based on choices in hardware and software. Publishers don't use small paperbacks to publish textbooks that contain highly detailed illustrations and tables. In the same way, smaller more portable eBook reading devices like PDAs are most often used for light recreational fiction. Reference books that are more detailed are better reproduced on larger computer or laptop screens. Even dedicated readers show a tendency for one type of content with their choice of color or black and white, size, and cost. For example, the Rocket eBook is the size of a large paperback, costs about $200 and has a black and white screen. This makes it most suitable for recreational reading. The proposed Everybook Dedicated Reader has two larger 8.5" X 11" color screens and will be more expensive, but it is much better for reproducing technical material with color illustrations. Software standards show the same kind of dichotomy. Some readers concentrate on producing reformatable text with few technical enhancements. Other reader software seeks to reproduce exactly the layout of a printed page, including placement of illustrations and figures. This variety in the eBook publishing industry means that each vendor will have different capabilities when it comes to meeting the challenges and taking advantage of the promise of eBook publishing. There are three stakeholders in any discussion of the benefits and challenges involved in producing and reading eBooks. They are the publishers, authors, and readers. Authors are concerned about Digital Rights Management (DRM) and interested in the availability of an expanded market. Publishers are also concerned about DRM, but to them an expanded market can be more of a threat than an advantage. Finally, consumers have an entirely different viewpoint. For them, price, availability, and portability are prime concerns. Each group has a slightly different list of pros and cons. The rest of this chapter covers the obstacles and promise of emerging eBook publishing. These issues will have differing importance for each of the groups discussed above. Different software formats or reader devices will also face these obstacles or take advantage of these promises differently. The promise of eBook publishing will be covered first. Remember, not all the hardware, software, and content combinations can take advantage of these benefits. Most of the advantages inherent in eBooks are related to the technological differences between electronic publishing and traditional paper publishing. EBook technology makes things possible that could never be attempted on paper. Nevertheless, many of these technological advantages are two-edged swords. For example, displaying the text of a book electronically makes it easy to resize text for vision-impaired readers. But, the same font technology contributes to eyestrain for regular readers since onscreen fonts aren't as well formed as printed text of the same size. Many of the other advantages listed below also have matching problems. The advantages of eBook publishing can be broken down into readability, usability, changeability, portability, multimedia capability, and availability. People with various levels of vision impairment have always had problems with traditional publishing. Large print editions help many readers, but they have always had limited availability. The cost of resetting type for a large print edition limits the number of books produced in this format. Audio books are another solution, but they are even more limited in availability. Some eBook formats are perfectly suited for reading by the vision impaired. Scalable font sizes work better on a format that allows reformatting of the books rather than just magnification. Some formats, such as the proposed Open eBook standard (OEB) Rocket eBook, and AportisDoc, allow this, while other formats based on Adobe portable document format (.pdf) only allow scaling of the page. EBooks also offer hope for those who are completely blind. An eBook based Braille Reader is currently under development by the National Institute of Standards and Technology (NIST). The Braille Reader is based on OEB that stores content as reformatable text rather than images, which makes it easy to translate output into Braille. Prototypes of this Braille Reader have already been tested successfully. There are even possibilities when scalable font sizes or Braille-based readers won't work. Computer generated voice software is already available on standard operating systems like Microsoft Windows 98 and Windows 2000. It will soon be possible to include this technology in dedicated readers as well. Even readers as small as the 3Com Palm Pilot or Pocket PCs running Windows CE may eventually have computerized voice software. Advances have also been made in the basic usability of eBooks. Most eBook formats allow hypertext cross-reference links both within the book and to the Internet. Clicking on a reference in the text can take you to an illustration, a footnote, or even a totally separate chapter. For example, if you are reading this as an eBook click on the attached reference to go to a sample footnote (see sample footnote). Not all eBook readers support this capability. Screen size is an issue on many of the reader platforms that will be covered in this book. For example, the new Pocket PCs that implement the new Microsoft Reader software are only 240 X 320 pixels. The use of thumbnail illustrations as links to full illustrations can alleviate some of the problems inherent in such small amounts of screen real estate (see figure 1.a below for an example). Another enhancement to usability is the addition of full text search in many eBook formats. EBooks can be searched for a word, a phrase, or an entire sentence. Right now, you can only search for exact matches. The inclusion of “fuzzy logic” search technology should eventually become available in eBooks just as it is appearing on the Internet. The final enhancement to usability deals with the integration of a dictionary into an eBook reader. How often have you been reading a book only to come across a word that you didn't recognize? Imagine having instant access to a full dictionary definition of that word. If you are using an eBook reader like the Glassbook plus reader, the Rocket eBook, or the Microsoft Reader, you can use the integrated dictionary to lookup unknown words. 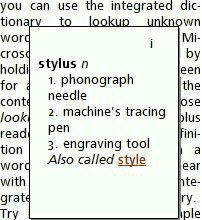 For example, in the Microsoft Reader select a word by holding the stylus on the screen for a few moments. After the context menu appears, choose lookup. In the Glassbook plus reader, you can access a definition by double-clicking on a word. A pop up box will appear with a definition from the integrated dictionary. Try it now or see an example from the Microsoft Reader in Figure 1.a. One of the traditional problems with electronic text has been the inability to make marginal comments or highlight. In order to protect Copyrights, most eBooks will be distributed in “Read Only” formats. However, consumers still want to highlight and make marginal comments, especially in technical or educational texts. Many of the readers and formats covered in this book allow the reader to insert bookmarks, attach marginal comments, and visually highlight specific passages. If your reader supports these features, try them out now. First, create a bookmark. This is usually done by choosing a menu option or right clicking on the text to gain access to a context menu. The same context menu will often allow you to add a note or highlight a section of text in a different color. Notes may be printed in the margin or a visual indicator may be placed on the page that allows you to jump to the note for viewing. Publishing revisions is another advantage afforded by the electronic nature of eBooks. Textual errors, corrections, and clarifications can be made without having to reset type for another print run. Books that deal with subjects that change frequently can be updated and redistributed easily. In fact, verifying who should get updates is more difficult than creating the updates. Many of the standards and technologies covered in this book are evolving very quickly. Some have even been replaced or superseded since research began for this book six months ago. The changeable nature of eBooks will allow me to easily update the text of this book as topics evolve. A secure web site will make these updates available online. Complete revisions should be available yearly. eBook readers vary in size from PDAs as small as the 3Com Palm V to desktop computer systems with full size 17” or even 20” monitors. No one would consider a desktop personal computer portable, but laptops, PDAs, and other dedicated readers are portable. Many of the PDAs are smaller but weigh about the same as a large paperback and dedicated readers are often the size and weight of a hardback textbook. This makes it possible to take a book with you and read anytime, anywhere. Nevertheless, the physical portability of eBook devices is not the only measure of the portability of eBooks. All of these devices can carry not just a single book, but a whole library at one time. An average eBook is usually less than 500Kb and even small reading devices have at least 2Mb of storage (4+ books). Many devices have 8Mb or 16Mb and some allow the use of extra memory in the form of Compact Flash that can go as high as 128Mb (256+ books). Laptop and Desktop computers are only limited by the availability of removable media, such as floppy disks, or the size of their hard drives, which are measured in Gigabytes. Another measure of eBook portability is the method of acquisition. Although some eBooks are distributed on physical media like disks or CD-ROM, the primary method of retrieval is by downloading from the Internet. This makes eBooks available anywhere you can gain access to the Internet. There are also some eBook reader systems that only require an Internet web browser to read a book online. Although your desktop computer may not be portable, these systems can be accessed from almost any Web browser. Browser-based systems lack some portability because you can only read online, but gain in portability because they aren't limited to a particular hardware device. Other multimedia enhancements are also possible. Illustrations are no longer limited to snapshot pictures. An author could include animations that show an evolving process or short film clips that illustrate a point. Tables could also be animated to reveal results as associated text is read. Traditional publishers must predict how many copies of a book they will sell when they make their press run. Although reprinting is less expensive than the first run, it is still an expensive process that is only offset by economies of scale. This makes predicting the size of a print run critical for traditional publishers and leads to a phenomenon known as “Out of Print”. We've all run into the problem of trying to purchase a book that was last year's best seller only to find that it's no longer available. Limited shelf space in bookstores also leads to a quick turnover of most traditionally printed books. “Print on Demand” is one answer to this problem for traditional publishing, but it requires a few days of lead time. As mentioned previously, most eBooks are immediately downloadable. Once an eBook has been created, it can be downloaded once or a million times with no change in the cost or storage requirements. This makes it easier for online bookstores and libraries to keep eBooks available for extended periods of time. Many eBook publishers have actively courted authors whose books are now “Out of Print”. Converting these books to eBooks will make them available to a whole new generation of readers without incurring the cost of another print run or shelf space in a bookstore. In the next chapter we cover an undertaking called Project Gutenberg that focuses on converting books in the Public domain into eBook formats to enhance their distribution. Thousands of books that were available only in libraries and private collections are now available in eBook format thanks to the volunteers of Project Gutenberg. The Problems of eBook Publishing: Click Here for Part II of this series, The Problems of eBook Publishing. **Paul Papanek Stork is a Senior Lecturer and Director of the E-Ideas Lab for Weatherhead School of Management at Case Western Reserve University. Paul has an MBA from Weatherhead and is a Microsoft Certified Trainer, a Microsoft Certified Systems Engineer plus Internet, and a Certified Novell Engineer with more than 14 years experience designing, implementing and supporting Microsoft and Novell Networks. Prior to his appointment as a lecturer at Weatherhead in January of 2000, Paul was an active member of Microsoft's Windows 2000 Rapid Deployment Program for DeCarlo, Paternite, and Associates, Inc. As a staff instructor at DPAI he was one of the first MCTs in the Midwest to teach Beta classes on Windows 2000 to other trainers and network engineers. Excerpted from eBook Publishing: Standards and Technologies, by Paul Papanek Stork. Reprinted by permission. © 2000 New Riders, Inc. All Rights Reserved. No part of this excerpt may be reproduced or reprinted without permission in writing from the publisher.